Honey is substituted for granulated sugar, and adds more layers of flavor when paired with whiskey. 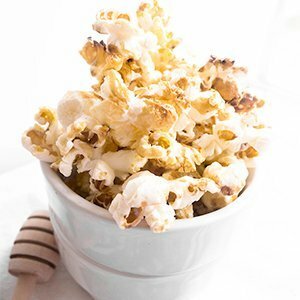 The slight shell that develops over each popcorn kernel is sweet and salty, with floral notes. Add ¼ cup vegetable oil to a pot with a lid. Add 1 kernel of popcorn and cover the pot with the lid. Set heat to medium-high. When the kernel pops, add enough kernels to the pot so they cover the bottom of the pot in one layer. Close the lid and gently shake the pot. When the popping slows, remove from heat. In a large bowl, whisk honey, whiskey and vanilla together. Add popcorn and use a spatula to evenly coat. Pour the popcorn onto a silicone baking mat on a baking sheet. Sprinkle on sea salt. Place in the oven at 350°F for 10 minutes, or until the popcorn dries and develops a thin, crisp shell.